Pauline Kael notoriously derided “Star Wars” as being “exhausting”, a sentiment with which I never agreed. Not because I was a kid when I first saw it but because George Lucas’s space opera was streamlined, the context of Rebellion v Empire strictly limited to Good v Evil, and the mystical Force breezily explained in a couple sentences. In “The Last Jedi”, alas, writer/director Rian Johnson is tasked with honoring the comprehensive mythology that Lucas’s film spawned, never mind paying fealty to his Disney overlords, dealing a fatal blow to efficiency. If Johnson infuses a little more lyricism, which was another of Kael’s complaints, that feels less the point than an addendum to the relentless plot, which emerges as a weird paradox because so much of the movie is spinning its wheels, making it feel, well, exhausting. And if Johnson does deepen the principal relationship between good Jedi Rey (Daisy Ridley) and bad Jedi Kylo Ren (Adam Driver), while even managing to dress up the Force as something more, he nevertheless ultimately becomes pinned down by the franchise’s apparently indestructible repetition. That repetition is seen where we last left off, in the struggle between Resistance v First Order, which is just Rebellion v Empire re-dressed for a new generation. They are in the midst of a gigantic space battle as the traditional opening scrawl concludes, and though the broad strokes are business as usual, Johnson still adds his own flourishes rather than mere J.J. Abrams-ish callbacks, and concludes the sequence by stretching one instant into a few instants, giving it some feeling as opposed to simple sensation. Though these sorts of stolen moments are sprinkled all throughout “The Last Jedi”, they are merely stranded along the film’s edges, and Johnson’s determination to keep the plot churning not only offsets his sometimes expressive images but removes any sense of emotional grounding at the center, particularly where his non-Jedi characters are concerned. If Oscar Isaac’s Resistance pilot Poe Dameron is supposed to be the new Han Solo, he never comes close. It’s not even that Poe remains noticeably underwritten because Isaac is a good enough actor to individually evince character, but that Isaac is given no space to stretch his acting legs, shuttled from story point to story point. The one scene teasing potential involves Dameron and newcomer Holdo (Laura Dern), purple-haired Resistance Vice Admiral, even if they are forced to communicate in recycled Han & Leia barbs (“flyboy”). Yet rather than giving these fine actors room to maneuver, they are instantly moved apart, snuffing the spark before it can catch. John Boyega, meanwhile, back as heroically treasonous Stormtrooper Finn, finds a nice comic chemistry with Kelly Marie Tran’s maintenance worker Rose Tirico in their initial scene playing a little on “The Man Who Shot Liberty Valance.” But that chemistry is trampled by the ludicrous speed twists of their B-plot to try and do in a star destroyer and blahs out their semi-burgeoning romance. Admittedly their quest finds room to re-consider the Resistance, a little like “Rogue One”, as something closer to terroristic insurgents rather than clear-cut heroes, though “Last Jedi” mimics that spinoff in never firmly committing to this idea. Still, it hints at something deeper and darker, and this manifests itself on the island hideaway where Rey found Luke Skywalker (Mark Hamill) as “The Force Awakens” concluded. If Rey seeks Luke’s help both for herself and the Resistance, Luke is uninterested, played by Hamill with great relish. If he never quite settled into his role as cleanly as Harrison Ford, here he finds a grizzle countenance that is as slyly humorous, improbably emitting notes of his turn in “Jay and Silent Bob Strikes Back”, as it is gravely serious. More than ever, that oft-cited pull of the dark side of the Force feels paramount which is underlined in the island caretakers, CGI creatures that come across culled less from Lucas’s points of origin than “Stromboli” or “Black Narcissus”. The allure of the dark side extends to Rey, particularly in scenes where she and Kylo Ren share the screen even though they are not technically together, sequences intended to crackle with the most genuine sexual tension this saga has ever allowed. But while Johnson goes so far as to indulge in shots of a shirtless Driver (who never stops acting even if you can sense the memes unspooling as this happens) Ridley, so strong playing jaw-clenched grittiness, can’t quite convey the perverse rumblings in her soul. Still, their climactic light saber duel, which turns into so much more than a mere duel, does have a charismatic pull on account of Johnson forgoing the Empire spirit color of gunmetal grey for a blood red backdrop, signifying the lifeblood pulsing through the characters in this violently balletic clash. It also teases transforming the whole saga into something else. 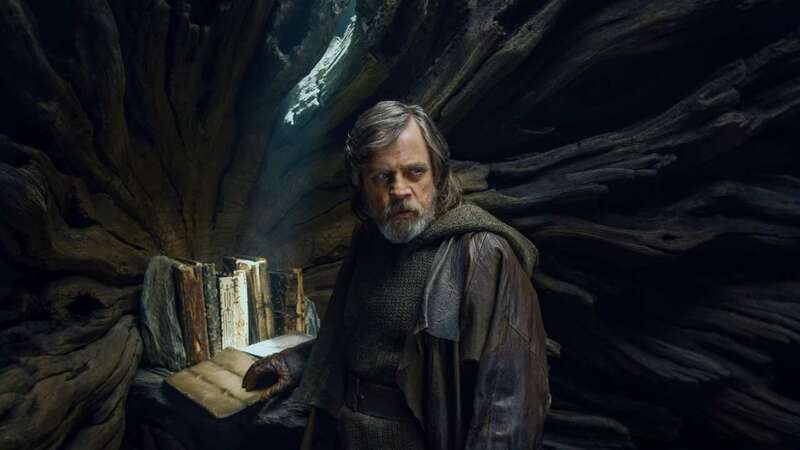 One of the most arresting images in “The Last Jedi” concerns a Sequoia of sorts on Luke’s island hideaway, one bearing all pertinent Jedi texts, where Luke tries to disabuse Rey of her ideals. Johnson sets this shot with the roots of the trees directly behind Luke, eliciting the impression that they are exploding out of him, visually conveying how the saga’s entire history is tied directly back to him. Rey, on the other hand, has an exit just over her shoulder, a chance for a clean start. She doesn’t take it, half-circling him, coming to rest in the same place he was, assuming her place within that sizable history. And even if this tree goes up in smoke later, it’s ultimately a fake out. Oh, “The Last Jedi” plays like it wants to rip up “Star Wars” up and start again, but it never does, no matter how many new characters it introduces, because these characters are simply outgrowths of previous characters, new conscripts in Good v Evil and for all the delightful newness crammed in, there are nevertheless traditions that must be upheld. The movie ends with a semi-recycling of the Hoth attack from “The Empire Strikes Back” where the aerial crafts employed by the Resistance are so old and worn out they fall apart mid-flight. The inadvertent symbolism is hard to miss.